After a truck accident, you may find yourself battling insurance companies and corporate attorneys for a fair settlement. You know you need an attorney, but how do you know you’re hiring a qualified attorney for the job? Truck accidents and the cost of their injuries are on the rise. Unlike regular passenger vehicle accidents, it requires special knowledge of these types of cases to get a settlement you deserve. It is important to meet with a truck accident attorney first and see if you have a case. And, while you are there for your free consultation, make sure you ask these key questions so you can feel more confident in your attorney selection. What are your legal fees going to be? While most accident attorneys take cases on a contingency basis, others may have a fee. You will want to know upfront how much you will owe – and especially how much you will owe if your case is not won. While contingency-based attorneys don’t charge anything upfront, some may have a fee at the end even if you don’t win your case. What is your experience with truck accidents? It is important to find an attorney who is experienced with truck accidents. Because these types of cases often involve multiple parties – truck driver, their employer and possibly another to name a few – you need someone who knows how to find potential plaintiffs in your case. Trucking accident cases often involve a lot of technical knowledge; therefore, your attorney needs to be familiar with the evidence required in these types of cases and where to find that evidence to prove their case. Ask the truck accident attorney whether or not you have a case and if it is worth it to pursue. Your attorney will assess your state’s laws regarding accidents, the evidence, and can tell you whether or not you have a valid claim. What if I am partially to blame? If you are partially responsible for the accident, then your attorney needs to know this upfront. You can still collect damages for the portion you were not responsible for, but this will dramatically change the circumstances regarding your accident. Leifer Law Firm has helped countless victims just like you bring lawsuits against trucking companies. 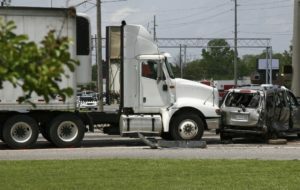 If you or a loved one was injured in an accident with a semi-truck or commercial vehicle, then contact us today for a free consultation at www.leiferlaw.com. We can tell you right away if you have a case and help you get started with your claim. Call now.